Archadeck Central CT builds decks, porches, screen porches. For over seventeen years, Archadeck of Central Connecticut has been building decks, screened porches, sunrooms, and other outdoor living spaces throughout Central CT.
We invite you to call for a free design consultation (and/or a free deck safety inspection if you happen to own an existing deck). At your consultation we’ll show you past projects, discuss your needs and tastes, explain your construction material options, talk about costs, and measure and photograph your home/lot. If you move to the next step, we will create a design drawing for your project. Once you sign a contract, you will be protected by two separate guarantees, constituting the most expansive customer protection plan in the industry. And local oversight assures your property and privacy are respected. We attend to every detail from securing any needed building permits to final cleanup. And we work very hard to be as unobtrusive as possible during the entire construction phase. We design and build decks, porches – including open porches, screened porches, front porches – pool decks, spa decks, gazebos, pavilions and sunroom additions using composite materials from Azek, Fiberon, TimberTech and other top flight decking manufacturing companies as well as traditional decking materials including Pressure Treated Southern Yellow Pine, Ipe’, Cedar, Mahagony. We have also designed and built some large commercial projects and a number of residential projects using Bamboo decking – an environmentally friendly choice with outstanding in-use characteristics and a distinctive appearance. Amston, Andover, Ashford, Avon, Bakersville, Barkhamsted, Berlin, Bloomfield, Blue Hills, Bolton, Bozrah, Branford, Burlington, Canton, Canton Center, Center Groton, Centerbrook, Cherry Brook, Cheshire, Chester, Chesterfield, Clinton, Cobalt, Colchester, Columbia, Coventry, Cromwell, Deep River, Derby, Durham, E Glastonbury, E Hartford, East Berlin, East Glastonbury, East Granby, East Haddam, East Hampton, East Hartland, East Lyme, East Willington, East Windsor, East Windsor Hill, Ellington, Elmwood, Essex, Exeter, Farmington, Fenwick, Fitchville, Franklin, Franklin Hill, Ft Trumbull, Glastonbury, Guilford, Gurleyville, Haddam, Haddam Neck, Hadlyme, Hamden, Hazardville, Hebron, Higganum, Ivoryton, Jordan Village, Kensington, Killingly, Killingworth, Lake Garda, Lebanon, Lyme, Madison, Manchester, Mansfield, Mansfield Depot, Mansfield Dpt, Mansfield Hollow, Marion, Marlboro, Marlborough, Melrose, Meriden, Middle Haddam, Middlebury, Middlefield, Middletown, Milford, Milldale, Moodus, Mount Carmel, N Branford, N Franklin, N Westchester, New Britain, New Haven, New London, Newington, North Branford, North Canton, North Franklin, North Granby, North Haven, North Lyme, North Westchester, Northford, Oakdale, Old Lyme, Old Mystic, Old Saybrook, Orange, Plainville, Plantsville, Pleasant Valley, Poquonock, Portland, Prospect, Quaker Hill, Riverton, Rockfall, Rockville, Rocky Hill, S Glastonbury, S Willington, Salem, Silver Lane, Simbury, Simsbury, Somers, Somersville, South Glastonbury, South Lyme, South Willington, South Windsor, Southington, Stafford, Stafford Sp, Stafford Spgs, Stafford Springs, Staffordville, Storrs, Storrs Mansfield, Suffield, Talcottville, Thompsonville, Tolland, Torrington, Trumbull, Turnpike, Uncasville, Union, Unionville, Vernon, Vernon Rockville, W Hartford, W Suffield, Wallingford, Waterford, Weathersfield, Weatogue, West Ashford, West Hartford, West Hartland, West Haven, West Mystic, West Simsbury, West Stafford, Westbrook, Wethersfield, Willington, Wilson, Windham, Windsor, Windsor Locks, Windsorville, Wolcott, Woodbridge and Yalesville. Your crew was a pleasure to work with. You have been one of the most pleasant contractors we have dealt with. It was a totally hassle free project from minute one. Working with Archadeck was a terrific experience! We contracted with Archadeck to remove our existing deck, install an area for a hot tub, new decking, railings, patio, lighting, bench seating, and this spring, a grill island. Basically, an entire backyard renovation. It was important to us to find someone that could offer us suggestions on what might look good and provide functional expertise since a project this size was well beyond our imagination. The material they suggested and their attention to detail far exceeded our expectations. One of the best parts about working with Archadeck is their network of contacts. They were able to refer us to quality electricians, hardscaping, and a company that builds grill islands. So not only were we pleased with Archadeck, but we were also very impressed with everyone they sub contracted with to complete this project. Everyone we dealt with from the company was courteous, good at what they did, and the project was finished ahead of schedule. They consulted with us at each phase of the project, and we made a few alterations during the build process, and they offered excellent suggestions along the way. Ultimately, we couldn’t be happier to be working with Archadeck. We take great pride in showing off the porch and we have received many compliments from our friends and neighbors. We would be happy to speak to any of your customers who would like to build a similar addition. From the negotiation stage to completion of the project, you were fair and honest, good qualities in a builder. We want to let you know that we are very pleased with the beautiful sunroom and porch. Thank you very much for your open creativity and willingness to spend the time required in designing a unique, elegant, and very functional addition. If you want something done right, go with a specialist. 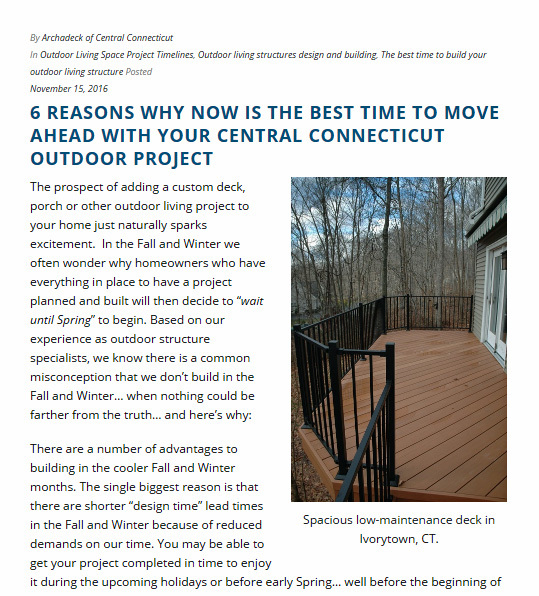 In 4 days, Archadeck of Central CT went from the initial site visit to detailed drawings of our new deck with 3 price options, explaining the difference, accommodating design requests that other contractors said weren’t feasible. We signed, and everything went according to plan. The crews were prompt, friendly, and professional. Even after the final payment, calls and visits followed to ensure everything was done right. Top notch all the way. We are extremely happy with our new deck. From design through project completion, we were treated very well by everyone on your team and we are thrilled with the entire Archadeck experience. I am enjoying this new addition to our home. Our compliments to your work crew. They were more than competent and professional. I look forward to spending my summer enjoying my new porch. I want simply to let you know that my wife and I consider our new deck and screened-in porch to be the most significant and meaningful investment in our home that we could have ever made! We can’t thank you and the Archadeck team enough for the beautiful deck and screened-in gazebo that you designed and built for us! Everyone that visits us is not only impressed with the design and how everything looks, but the quality of the work as well. Our new deck and gazebo have certainly added a lot, both in appearance and in value, to our home. My wife and I contacted Archadeck as one of several companies we considered to build a new deck and screened in porch. From the very beginning we knew we were dealing with an excellent company. The process of getting an estimate was thorough, honest and straightforward. The people were friendly, helpful, and clearly trying to help us decide what we wanted, not just out to get the biggest job they could. We hired them and the whole process was without surprise. They came when they said they would, did the job in the time frame they promised, and we couldn’t have been happier. I was particularly impressed with the little things that I had never even thought of (screening under the deck to keep small insects from being able to come in through the floorboards, for example). Our screened-in porch is now my favorite room in the house. I’m in Connecticut, but I spend time in the porch 10 months a year. It is an absolutely beautiful addition and clearly shows incredible workmanship, quality and concern for the work that Archadeck performs. Finally, the owner of Archadeck has stayed in touch to be sure all is well. I know you can find someone to put up a deck/porch for less money, but frankly, not that much less, and I can’t imagine anyone doing this kind of work with the kind of quality (of materials and labor) that these folks offer. I don’t usually write reviews like this. But I do believe in sharing the facts when I find this kind of quality and care in someone with whom I do business. We are currently working with Archadeck to replace our existing deck with a new screened-in porch and patio area. We are still in the designing and permitting phase, but thus far the process has been smooth and very enjoyable. Phil is a wonderful collaborator and we have thoroughly enjoyed discussing all of our ideas with him to come up with a plan for an amazing outside space. Archadeck of Central CT are true experts at what they do. Their design and craftsmanship are of the highest level with very competitive pricing. A great company all around. I could not be happier with my new deck! The only contractor i have ever hired that did everything they promised and then some. Excellent work. True professionals. Love my deck a year after installation. It was professionally done and has held up well. Easy to maintain and still looks beautiful. This is a professional organization with good customer service. Phil Brown and his crew just completed a complete deck replacement and expansion for us. We wanted to replace a pressure treated deck with a larger deck incorporating as much composite materials as possible to minimize maintenance. From the very beginning (design process), thru the finish, this company was a pleasure to work with. Their pricing was fair and the workmanship was excellent. I highly recommend them. the years and none have been as professional, Our project was built on time and exceeded all our expectations. I would recommend them to anyone looking to build a deck. You won’t find anyone better. After almost a decade since my deck was built, I still marvel at the incredible workmanship, design, and quality of the work Phil Brown and Archadeck did. From start to finish, they were incredible, and friends still comment on the work and the finished product. The cost was very reasonable, the job was done in a timely manner, and virtually every detail was impeccably managed and completed to my total satisfaction. I’m now considering adding another addition to the deck and very honestly, I wouldn’t have anyone other than Phil and his staff handle the job.Thanks Phil and Archadeck!! Looking out my window and seeing our beautiful maintenance-free deck still makes me happy five years after Archadeck installed it. It still looks brand new and we haven’t had to stain it every year like we had to do with our old deck. Last summer we had a new roof installed, and dealing with that contractor really highlighted what a good experience we had with Phil Brown at Archadeck. There were no bumps in the road – the job was completed right on schedule with no surprise price increases. 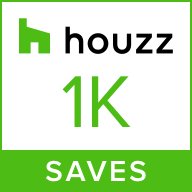 It’s a pleasure to highly recommend a contractor who did meticulous work on time for the price he quoted. My husband and I hired Archadeck to design and build our new deck. We have been very impressed with their professionalism, response time and willingness to discuss options based on our needs and budget. Their project management approach made it easy for us to understand the tasks to completion. The design process and build went smoothly. It has been an easy and enjoyable experience working with Phil and Paul. We highly recommend Archadeck and plan to hire them again for our next project. Best contractor I’ve ever worked with, very dedicated to every project and is a great designer as well. I would give him top ratings across the board for quality and cost. Patient, professional and overall an easy experience.